Better brand boy's white striped seersucker special occasion outfit. Matching twins sister dress available. 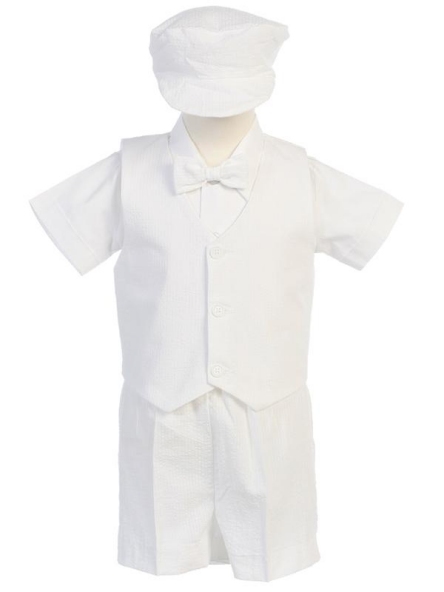 Crisp 100% cotton seersucker 5-piece short set in solid white. US made by Lito. The shirt is 35% cotton, 65% polyester. The set includes lined vest, elastic waist shorts, clip-on bow tie, cabbie hat and short sleeve dress shirt. Check the General Size Chart for Knicker Sets, Shorts Sets and Eton Suits and choose carefully.